The post Vacancy for freelance WordPress blogger at UpdraftPlus appeared first on UpdraftPlus. UpdraftPlus – Backup, restore and migration plugin for WordPress. In mid-2011, our current Head Developer David Anderson came across Updraft, a free backup plugin first released back in 2010 by a guy called Paul Kehrer. Impressed with its ease of use and ability to restore files, David began using it, tweaking and updating it with new code along the way. Wanting to share the improvements he’d made to Updraft with others, David got in touch with Paul (who’d by then moved on). Paul responded positively: “A patch like this sounds pretty fantastic and I’d love for someone with more time/energy to take over Updraft if you’re still interested.” And so it began: released in August 2011, UpdraftPlus 0.1 was clean, updated (to work with WordPress 3.2), and had a new encryption feature for backups. David made various improvements throughout the following 14 months, tinkering with a hobbyist’s obsession until 2012 when his life circumstances changed and he suddenly had more time to commit to the project. The more changes David made, the more positive feedback he received from users, who spurred him on to continue the good work. .When users started to say things like “I’d pay for a version with this-or-that in it”, David developed paid add-ons, and UpdraftPlus became a commercial enterprise. Officially registered in January 2013, Updraftplus.com launched its first website soon after, initially geared towards documentation and user support with a couple of simple add-ons available via WooCommerce. UpdraftPlus became a full-time project for David. It grew fast, acquiring new features and capabilities that surpassed those of long-established paid plugins. Tens of thousands of downloads turned into hundreds of thousands and Joe Miles came on board as Director of Business Strategy, along with other full-time employees and accountants. UpdraftPlus started to overtake established players. Today, it’s WordPress’s most popular backup plugin, with over a million active installs, which puts us in the top 20 most popular WordPress plugins in the world. 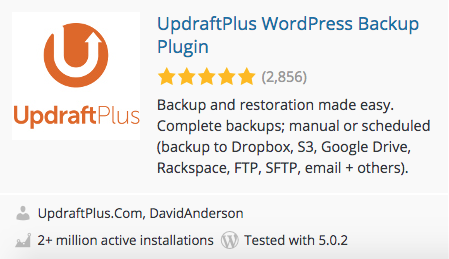 We’ve also got the highest star rating of any WordPress backup plugin (4.9 out of 5). Our reputation is extremely important to us, and we work hard to not only maintain high standards but also to continually develop new add new functionality and improved user experience. We offer our users the highest number of cloud storage providers. We’ve also developed our own cloud storage, UpdraftPlus Vault, which is backed behind the scenes by the power and reliability of Amazon’s market-leading computing services. In October 2016, we released UpdraftCentral, a powerful remote control for WordPress that allows users to backup, restore and migrate multiple websites from a single dashboard. At the end of 2016, we acquired the popular and highly-rated database clean-up plugin, WP-Optimize, which helps websites to run at optimal efficiency without the need for manual requests. In June 2017, we acquired Metaslider, a hugely popular plugin that makes it easy to create professional-looking sliders. At the start of 2018, we assimilated Easy Updates Manager, a neat little plugin that allows users to customise automatic updates on individual aspects of the WordPress core (including major, minor and development updates) as well as all themes, plugins, browsers, translations. Today, thanks to the support of our customers, our plugins are installed on more than 3 million sites. This makes us one of the most installed plugin companies and as a result, the UpdraftPlus team has more than 15 people across four continents. We’re always looking for the best coders, and also someone in marketing. If you’re interested in working for UpdraftPlus please apply here: https://updraftplus.com/updraftplus-hiring-wordpress-plugin-developer-wanted/. The post How to build a plugin company: how we grew from one man to a global business on 4 continents with 3 million users including NASA, P&G and Microsoft appeared first on UpdraftPlus. UpdraftPlus – Backup, restore and migration plugin for WordPress. This is a permanent position to help develop either UpdraftCentral, UpdraftPlus and WP-Optimize further. So ideally it’s full time (or almost full time). We’ll consider employment or freelance basis. Whilst we have a team in Cardiff UK, you can work anywhere in the world! Pay is competitive and will depend on your experience. Name a competitive long-term rate and we’ll consider this along with the other applicants. The post Wanted: WordPress plugin developer who uses UpraftPlus appeared first on UpdraftPlus. UpdraftPlus – Backup, restore and migration plugin for WordPress.